I learned this week that while I may own a number of Tiller/HPS games, I've mostly "played around" with them rather than actually learned to play them. I picked up Sicily '43 a couple of weeks ago and started to work through the tutorial scenario - where I found I very quickly that I didn't really understand this game engine nearly as well as I thought! This past week is actually the longest stretch I've actually played any of the games - and I really am beginning to understand what people see in them. Operation Husky, JOSS Beach, in the early morning hours of July 10th 1943: The easiest of all the landings occurred at Licata, where Truscott's JOSS Force encountered feeble resistance from the Italian 207th Coastal Division. The first wave came ashore in 45 minutes but, once ashore, quickly by-passed the enemy gunners. By 1000 it had successfully established itself on its objectives and broken up a lackluster Italian counterattack against a roadblock established at Station San Oliva. By the evening of the 12th July, the force beachhead extended from Palma di Montechiaro, inland to Canicatti, and northeast to Riesa. So not a particularly difficult scenario and one that I've actually already scored a Major Victory on in my practice play. For this play through I've added a number of optional rules and am actually playing the "Alt" version of the scenario from Volcano Mods, which changes some of the unit and combat characteristics. I'm also using Jison's MapMod and VocanoMan's unit graphics mod to help the game graphics look more palatable. When the troops first hit the beaches at 0200 resistance is light. A pair of machine gun companies from the 207 Coastal Division are all we encounter. That's good news since except for the 3rd Ranger Battalion and a company of the 3/30 RCT all my units are disrupted and have next to no movement points available. Two of my objectives, Licata and Station San Olivo are visible on the map above. I addition to these two, there are three other 100 point objectives at Palma Di Montchiaro to the west, Ravenusa to the north, and a pair of road bridges across the Pizzulo River on Route 115 toward Gela in the east. Always have a plan. With lots of arrows. 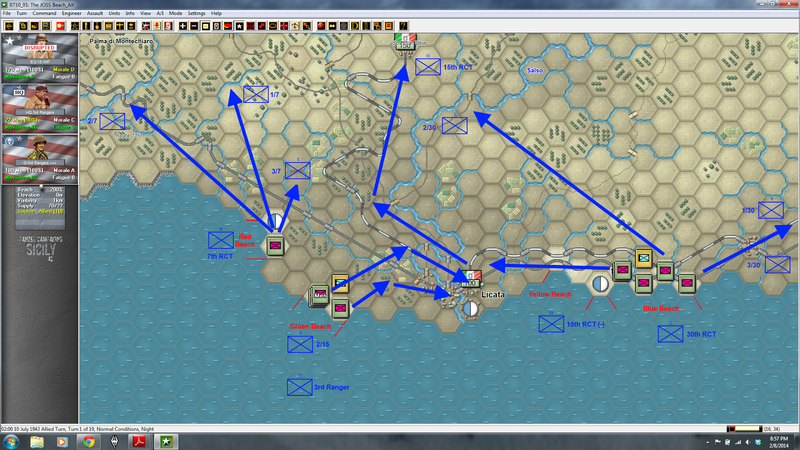 My plan is more or less Truscott's plan: 7th RCT lands at Red Beach, and 3/7 clears Route 115 to the north to allow the follow on battalions to get on shore. 2/7 will advance along Route 115 toward Palma and 1/7 will advance northwest to protect the flank of 2/7. 15th RCT and 3rd Ranger will assault and take Licata with a concentric attack from east and west from Green and Yello Beaches. After the town is secured, 15th RCT will advance north and take Station San Olivo. Finally, 30th RCT comes ashore at Blue Beach. 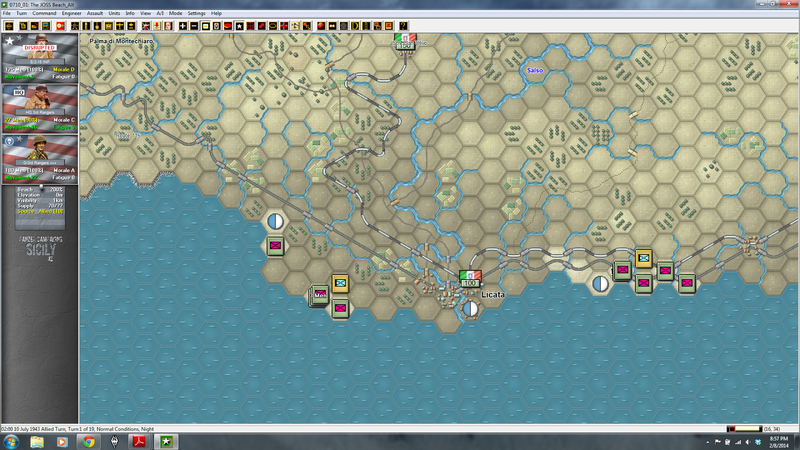 After eliminating any local opposition, 2/30 will attack northwest and seize the bridge over the Salso. As 15th RCT reduces Station San Olivo, 2/30 will continue north along secondary roads to attack Ravenusa - this will probably by on July 11th. Meanwhile, 1/30 and 3/30 with the regimental artillery will move east and take the bridges over the Pizzulo. At 0800 2/7 has started west along Route 115 while a company of combat engineers clears obstacles blocking the road. 3/7 begins to drive southeast along Route 115 back toward Licata to clear elements of the Italian 207th Coastal Division from the road. Eventually, this will take them nearly to the outskirts of the town itself. 2/15 and 3rd Ranger, broken down into individual companies (light green counters with yellow NATO symbols) are primed for an attack on Licata from the west. Three companies of 3/15 push from the east. The regimental HQ, artillery, and anti-tank company have yet to land. 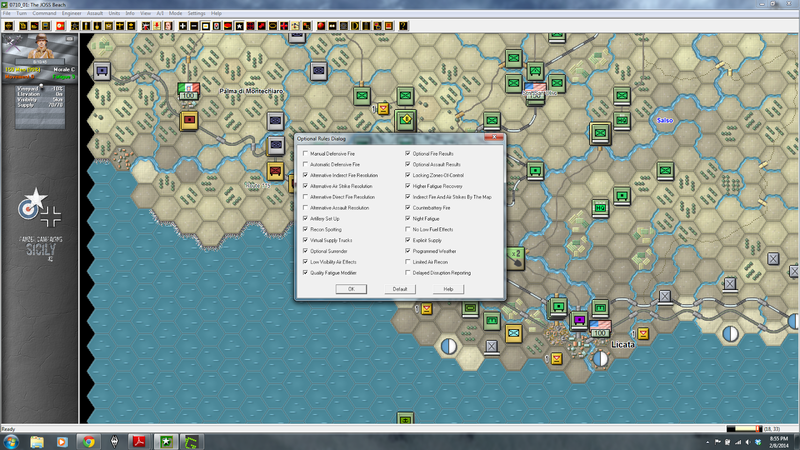 2/30 moves two companies to flank a unit of the 207th Coastal on the right. Again, the rest of the regiment along with some more engineers will land shortly. July 10, 1943 2200. No longer quite the walkover it has been. By 2200 Licata has fallen to the 3rd Ranger Battalion and 15th RCT. I'm reforming the 15th to drive north to Station San Olivo as darkness falls. Taking Licata took a little longer than anticipated - I probably could have sent a battalion of the 15th RCT north earlier to at least tie up forces around Station San Olivo earlier. In the west 7th RCT has pushed halfway to Palma, but are meeting resistance from the 177th Bersagliere Regiment and, more worryingly, KG Fullreide. The German unit is strong and of better quality than my troops in the 7th RCT. I intend to flank them with 1/7 and 3/7 to continue to move west. 2/30 has seized the bridge across the Salso east of Station San Olivo and will concentrate there until 15th RCT is up. Meanwhile, the remainder of the 30th is concentrating around the bridges over the Pizzulo, which are help by a battalion from the Italian 4th Livorno Division. Historically, this battalion participated in the attack on the Gela beachhead on the morning of 10 July, and so shouldn't even be there! With both Battles in Italy and Sicily '43 I'm being reminded of the importance of maneuver. 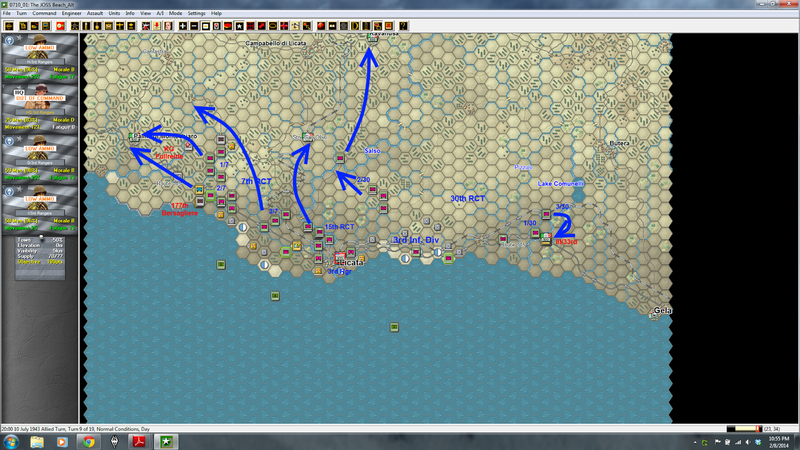 The German formations in Operation Husky are too big and of too high a quality to simply try and reduce via attrition. American units in particular have it bad in straight-up fights battalion versus battalion or regiment versus regiment. I cut my teeth on Ancients and American Civil War gaming and came late to WWII. I tend to want to clump groups of units together and maintain tight, close lines. German troops have no more trouble breaking through American lines like these in 1943 than they do Soviet lines at Kharkov. Love the tight lines comment. After I play SOW for any period of time I am always worried about leaving gaps in my lines. I also like the mods you are using for this.